Another weekend, another CAP training! On two weekends in February/March, Group 2 and Group 5 hosted two consecutive Airborne Photography (AP) Ground Schools, one at Squadron 188 in Oakland, California, and the second one at Squadron 14 in Sacramento, California. CAP members from around the Bay Area as well as Sacramento spent two days together, to be trained in becoming Airborne Photographers. With AP becoming the new #1 Mission for CAP in California Wing, there was a great deal of interest in this training opportunity. Capt Don Eichelberger of Squadron 188 taught both courses. How flying an AP mission, versus a more familiar SAR mission, impacts the roles of the 3-person crew, Mission Pilot, Mission Observer, and Mission Scanner-now-Airborne Photographer. Warning, this might require a bit of a cultural shift in how roles are allocated and viewed. Logistics involved in tracking and recording image metadata – a multi-person job! Digital image processing, handling, and transferring; file formats, etc. What and where is the target (name, location, and verbal description)? How should the target and surrounding area be imaged? Are certain lighting conditions over the target area more desirable than others? What information is needed to accompany the images? What image format and naming convention is needed? What image quality is needed? Is it OK to crop images or otherwise process them? Are some types of processing desired, like addition of text or symbols? What file formats are needed? Finally, during an imaging sortie and BEFORE you return to base, you must remember to check and make sure that you got all the quality images that you want, because you don’t want to fly all the way back to mission base and then discover that you missed a shot, or that your shots weren’t framed or focused properly, or that the GPS had become disconnected or lost satellite lock while you were taking the photos. As with the recent MS Ground School, the most fun was the hands on part: When we went to the hangar and saw for ourselves just how awkward it is to get the right shots at the right angle while crammed into the back seat of the plane, and how it really looks and feels to point the camera out of the plane at various specific angles. Even more fun was the Drive-by-(Photo-)Shooting where we practiced taking pictures of targets while driving past them, maybe not at airplane speeds but at least at automobile speeds. Next stop, practicing our new skills and demonstrating them in the Fam & Prep tasks. 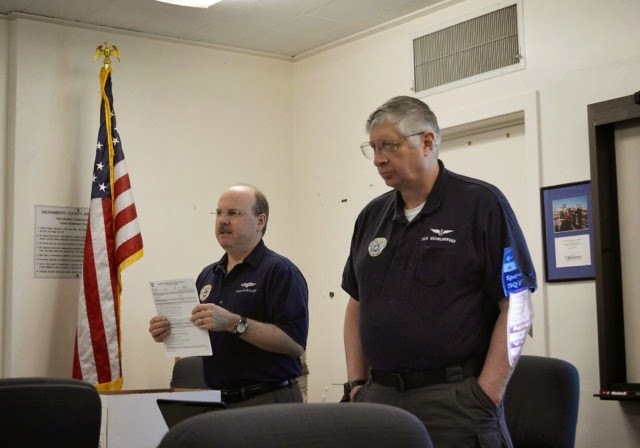 For those of you who have been through the AP Ground School: Make sure you sign up for the upcoming Disaster Relief Exercise in Sacramento (March 22-23) and/or the one in Oakland (May 3-4).